Phrog Personal Training Studio is a unique gym in Princeton, NJ that offers an extraordinary experience, and it’s not just the Kinesis system that makes it exceptional. As soon as you walk in, you’re welcomed by a stone fountain of flowing water. It’s very zen. The staff warmly greets you, and since it’s a small gym, you’ll know everyone, and they’ll all know you. The interior architecture has an organic feel to it. There are stone walls leading to a lounge area, wood floors, wood molding, wainscoting, and a curved wall in the hall. This recently renovated 9,000 sq. ft. facility has an intimate spa atmosphere, which I find much more appealing than gyms that appear clinical or industrial. In the Princeton area, this ambience is exclusively found at Phrog Fitness. 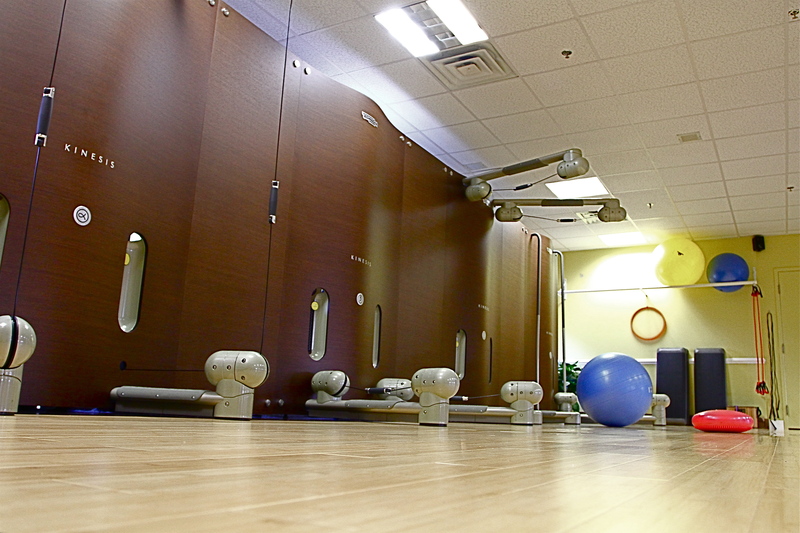 They use Cybex, Kinesis, LifeFitness, and Nautilus equipment which is all fairly new. This is the furthest thing from a large chain or cookie cutter gym. It’s unique, intimate, and holistic in its approach. Once you’ve joined, you’re given an assessment, and then you meet with the nutritionist. Your goals and limitations are discussed, and then you’re ready to start. A trainer is individually matched to you, but you can work with any of them. You can also have standing sessions, or book them on a weekly basis if you’re not sure about your schedule. Your session is recorded in a log, reminding your trainer what you did last. It also helps if you use a different trainer for the following session. A personalized experience is always guaranteed, and using the Kinesis equipment further customizes your workout. More about Kinesis in a bit. One room is filled with cardio machines, i.e. treadmills, stationary and recumbent bikes, elliptical machines, a rowing machine, and arc trainers on one side, and a weight machine, and various Nautilus equipment specifically for the legs are on the other side. There is no sea of equipment in an artificially lit room, but you’ll find equipment with some breathing space and lots of sunlight. You also won’t find distracting televisions in this gym, which I feel diverts you from the workout. Instead, you have music in the air to get you pumped, and a professional beside you for inspiration. On the opposite side of the half wall is a room for classes, which includes about four variations of yoga, Zumba, and more. These classes are small, and the instructor can personalize it just for you, whether, you’re a beginner or advanced, need low impact, etc., but regardless of your level, you will be challenged. The classes cover strength training, core conditioning, cardio, shaping and toning, flexibility, and stress reduction. The trainers will also work with you in this room at times. The entire right side of the gym is extremely bright and airy. Large windows let in lots of natural light during the day. In the back, there’s a small child care room. 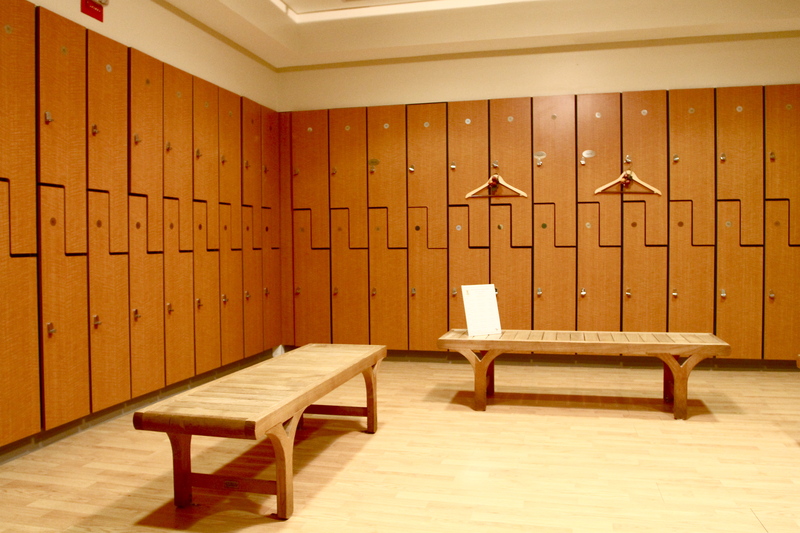 The men’s locker room is in the front, and the ladies’ locker room is in the back. Both are equipped with toilets, a changing room, lockers, showers with foam soap, and a sauna. Towels, toiletries, and a blow dryer are also provided. These areas are very clean and pleasant, and the ladies’ locker room has a handicap shower. Also for clientele with special needs, there is elevator access, since the gym is on the second floor. The opposite side of the cardio/weight area is also spacious, and has a couple of windows to let in some natural light. There is also sunlight coming in from across the hall. This room has a weight assisted chin/dip, a dual adjustable pulley system, dumbbells, fitness balls, and a wall dedicated to Kinesis circuit training. I love high-tech, so I was very excited to use Phrog Fitness Studio’s revolutionary Kinesis circuit trainer which is very cutting edge. Phrog Fitness is one of the few gyms in New Jersey to have the Kinesis Circuit and have licensed trainers to guide you through the workout. Kinesis is fantastic because its smooth pulley system is a joy to use, and what’s even better is the flexibility of the equipment. With Kinesis, the possibilities are incredible, since the equipment is designed to fit your needs. Due to the unrestricted movement, you can train for specific activities, i.e. golf, baseball, soccer, rowing, rock climbing, tennis and more. You even burn 30% more calories than on traditional machines. 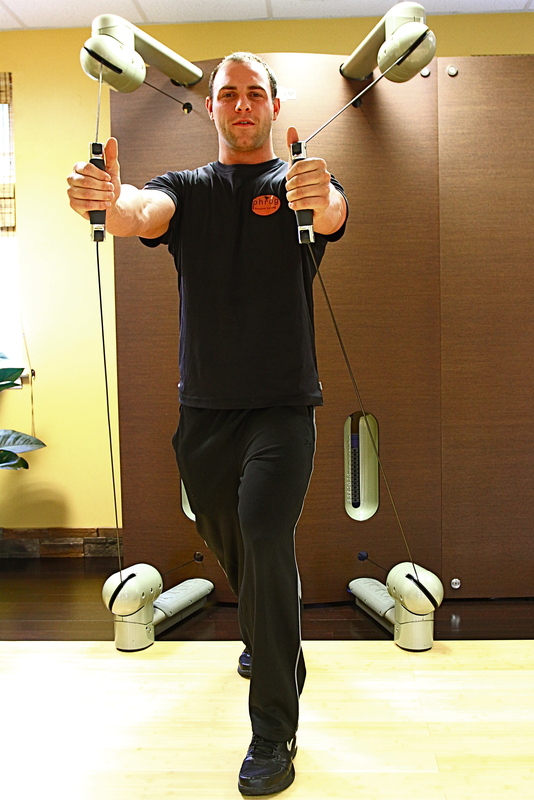 It helps with strength, flexibility, and balance, and I look forward to using Kinesis during every session. Watch the below video to see Kinesis in action. Phrog Fitness offers a unique, personal experience. You pay for the expertise of a personal trainer who will guide you through a safe and customized workout. They don’t push you to do something that causes distress to avoid damage. They know several different ways to work out a particular area if something is causing discomfort. There is no monthly membership fee, so this is a great deal. You pay for a multi-pack of sessions with a trainer and get unlimited use of the cardio equipment, classes, and the sauna at no additional cost. And did I mention the classes are semi-private? Sometimes there might only be you and one other person in the class. The largest class I’ve been in so far had a total of six participants. This allows a more modified workout during the class to fit your needs and ability. Even if you wanted to stay with your gym because they have an indoor pool, spinning classes, massages, or a juice bar, but wanted to use a trainer, for about the same price of one in your gym, you could use Phrog Fitness for their very experienced and certified trainers in a tranquil setting, and take advantage of the very small classes, because you ONLY pay for the sessions with your trainer. After each session, the trainers stretch your limbs, and give your neck and shoulders a quick sports massage. You really get the star treatment. If you want to feel like a VIP, this is the place to be. There are no crowds, it’s a peaceful environment, and you get lots of personalized attention. In addition, you get to use the Kinesis circuit trainer, which puts you in an exclusive circle. The highly skilled trainers will motivate you to do your best, and they make you feel extremely special here. There is an abundance of free parking, so finding a nearby spot is never a problem. If you’re in the Princeton, NJ area, you have to stop by to see the facilities, because the photos don’t do it justice. This is a great combination of a personal training and nutritional program with state-of-the art equipment, which is exclusive for the Princeton area. I LOVE YOUR BLOG POSTS!!!!! This looks like a great gym! Thanks Mimi! I have to bring you there one day. It’s amazing! I’m a client at Phrog and have to say, aside from being VERY effective for me, it is absolutely a unique and personal experience. I’ve belonged to gyms in the past and taken advantage of their personal training programs but this is very different. I cannot say enough about the personal attention, expertise, professionalism and friendliness of the Trainers. They know exactly what to do and they watch every move to be sure you are getting maximum benefit of the workout. I was never into fitness, so I am probably particularly challenging to them! I know their clients range from those, like myself, wanting to get into shape all the way to the high caliber athlete but my sessions are very specific to me and never boring. My compliments and appreciation goes to everyone at PHROG for helping me in my plan to get fit and making each session a terrific workout! Lucy, I couldn’t agree with you more. I actually look forward to going to Phrog to workout, and I used to dread it in the past at other gyms. It was just another thing to check off. Now I’m re-arranging my day so I can go. The trainers are absolutely fantastic at what they do, and I love the classes as well!